upload csv file in silverlight with header. read csv file and write into database with class……. you just use this code and resolve your problem. 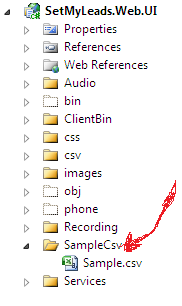 // you can replace and get the path of specific folder and file with in it. this error also heppend in silverlight application when you create user control or after fill list<myobj> and pass to griddate or radgridview( Telerick) control. You can change the code above so that the query executes on the UI thread by using the Deployment.Current.Dispatcher object. its giving me error “DependencyProperty of type System.Double cannot be set on an object of type System.String”. if you want to disable scrollbar from codebehind then use this code …….. There is no other way to finding a control inside a Silverlight page or controls. You need to traverse the container (Grid) element. this is a generic function that can find any type of control in side a container(Grid) control using recursion. parent: is the container control that needs to be traversed for the desired control like grid. ControlName: is the name/Id of the control to be searched for. Method will return the desired control if found in container otherwise NULL.